Sky Tyne & Wear came to Daylight Slayings on 24th March. 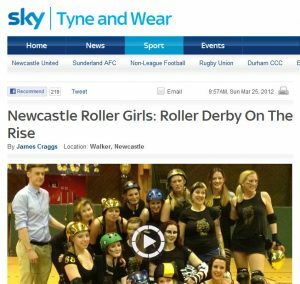 They took a peek at what we do & interviewed Brie Larceny and Kalamity James about Newcastle Roller Girls in particular and derby life in general. They’ve written a lovely article for their website, which includes 3 clips of interviews & bout footage. We particularly like the unintentionally hilarious footage of a miked up Dog whilst he bench coaching the Hinnies. We predict this will make him a star of the internet!